Flexible and affordable multichannel electrophysiology. The Open Ephys acquisition board is part of a complete platform for conducting multichannel electrophysiology experiments. And it's entirely open-source. This means you can build it at low cost and modify it to enable new types of experiments. Powered by industry standard Intan chips. Stream 256 channels via USB 2.0 or 512 channels via USB 3.0. 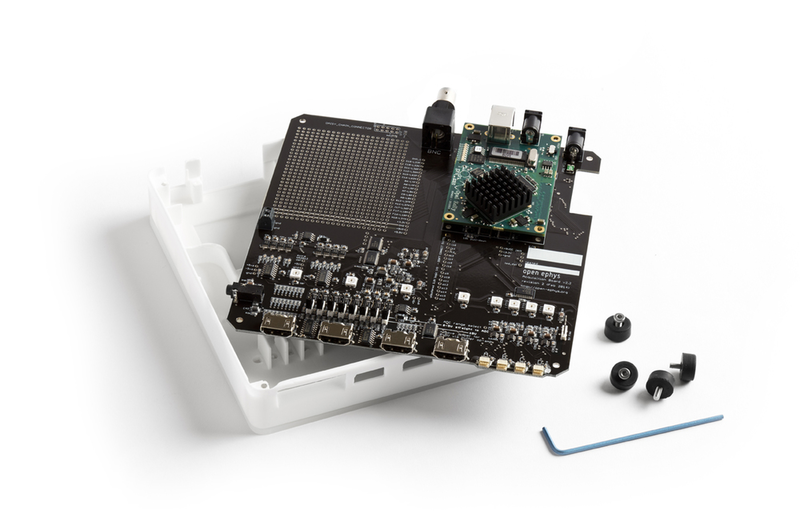 Use your system with a wide array of headstages, adapters & breakout-boards designed by you and other labs and know that things fit together seamlessly. The acquisition board was designed to be flexible and productive in practical use. The acquisition board works automatically with the Open Ephys GUI, which allows you to visualize and analyze your data in real time with a growing collection of plug-ins. 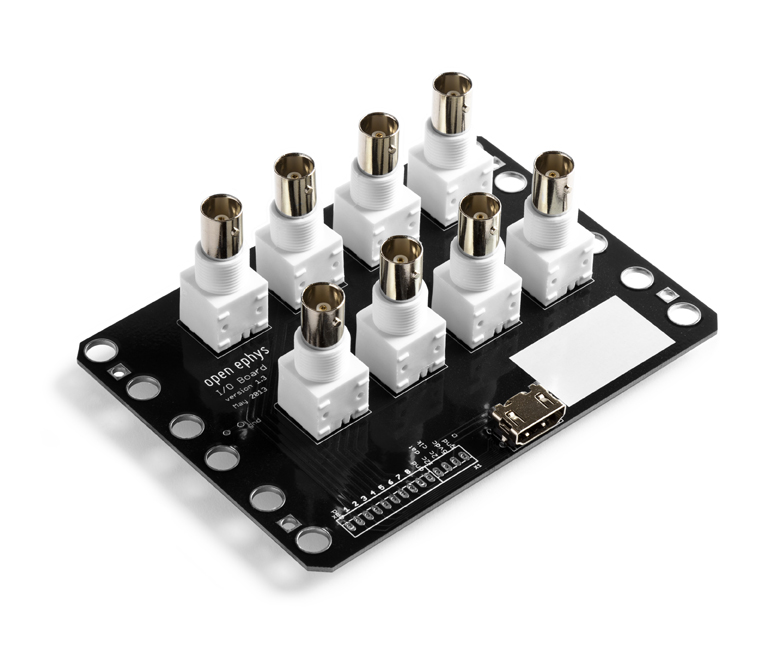 The Acquisition board has 8 channels each of digital in/out, 8 channels of analog input (±5V or 0-5V so these can record from microphones or piezo sensors) and 8 channels of ±5V analog output. All this I/O uses the same standardized HDMI connectors (wiki), so you can use the same breakout-boards for everything, or even incorporate a HDMI connector into your equipment and connect the system directly without any bulky BNC cables. The same connector standard is also shared by our Arduino I/O module (github) that can be used to generate or read digital signals on any PC. The acquisition board uses a standardized FPGA module by Opal Kelly. This means that the same acquisition board can be used with USB 2.0 or USB 3.0 interfaces simply by swapping the FPGA module. You can also make use of the FPGA to build very low latency closed-loop experiments. See our wiki for a list of possible applications of this technology. Example application: Stimulate optogenetically at specific phases of a theta oscillation. Neural data is streamed to the PC with a delay of ~10 ms. For many applications, this is fast enough to detect a neural or behavioural state and intervene with stimulus changes, optogenetic manipulation or whatever your experiments demand. Through the Open Ephys GUI, closed-loop stimulation algorithms can be written in C++, or Python and Julia using special versions of the software that are currently under development.